You must have noticed two significant shortcomings in most free DVD ripper for Mac OS- incapacity to remove watermark and time limit. Those free DVD ripper for Mac provide users with basic features such as converting DVD movie to MP4 video; however, other advanced functions are excluded from consideration. For instance, only few Mac free DVD ripper are capable of removing watermarks in the DVD and still leave the watermarks onto the converted video. Furthermore, some free DVD ripper for Mac with no watermark have the time, preventing the users from free ripping the whole DVD. What Is Watermark and How Does It Work? A watermark (more specifically speaking, digital watermark) is a recognizable audio, text, picture, or video which is deliberately embedded into a digital image, audio or video file. The watermarks are mainly used to provide the identity of its owners of the media so when the signal is copied, then the digital information also is carried in the copy for providing copyright protection. However, if would really affect your experience if you see unnecessary logo, icon, scroll words appearing over the DVD movies. If you hope to rip DVD free on Mac with no watermark or want to convert your DVDs to video files be played on your computer, iTunes, AppleTV, all what you need is MacX DVD Ripper Free Edition. It is lifetime free DVD ripper for Mac users to rip DVD to MP4, MOV,M4V video and extract MP3 or AAV audio from DVD without watermark. 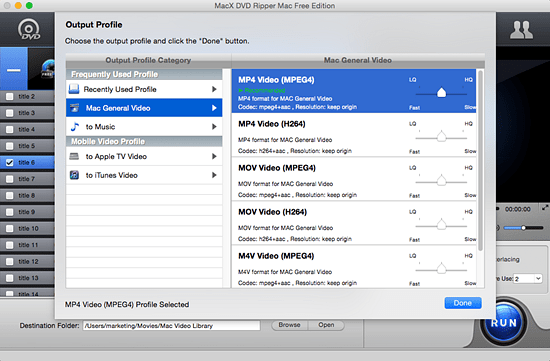 With this free Mac DVD ripper, you are able to watch the DVD movie directly on Mac computer, Apple TV, iMovie, QuickTime. Users will free to transfer the DVD movie to your iPhone XS/XR/X/7/Plus/SE/6S/6/5S, iPad Pro/Air 2/mini 4 or Android phones & tablets. Most notably, this software features the powerful decoding and ripping abilities to backup, convert and rip copy protected DVD which you own, by breaking through most commly-used copy protections like CSS, Sony ARccOS, UOPs, RCE, APS and more, so that you can rip the new movies on DVD without problem. Things now become simple and fast to rip DVD free on Mac. Free download DVD ripper on Mac, install and launch it. Click "DVD" to load the DVD which you want to rip. In the output format area, select one specific output format or device, such as DVD to MOV, DVD to MP4, M4V, iPad, iPhone etc. You can also adjust the audio and video parameters as you wish. Click the "Browse" button and choose the location where you would like to save the output video file after the Mac free DVD converter completes the process. Click "RUN" button and the DVD ripping process will begin. Wait for a few minutes and it will successfully rip DVD free on Mac with no watermark left on the converted video. Note: If you rip DVDs for playback on mobiles like iPhone iPad, MacX MediaTrans will help you. It is a strong iTunes alternative transfer tool which can easily transfer videos, movies, TV shows from computer (Mac & Windows) to iPhone 7/Plus, iPhone SE/6S, iPad Pro, iPad Air 2/mini 4 and more on iOS 10 in a flash, and more media like music, ringtone, books etc. Simply by drag and drop, any incompatible videos will automatically converted into iOS supported files without quality loss. If you want to further edit the ripped DVD movie like add watermarks, add effects or more, just turn to MacX DVD Ripper Pro, which comes with more features, wider support formats and more advanced ripping options. Note: The software developer calls for copying or ripping DVD under the concept of Fair Use and does not encourage any illegal reproduction or distribution of copyrighted content. Please abide by the local DVD copyright law before doing it. Free download best DVD ripper software full version for Mac and Windows to copy and backup homemade DVDs protected DVDs to computer, USB, iPhone, iPad, Android etc. Mac DVD ripper free to rip DVD on Mac for free? Best free Mac DVD rippers (Mojave) to rip protected/non-protected DVDs from Paramount, Warner etc to MP4, MKV, AVI, MOV, MP3 for iPhone iPad Android on iMac, MacBook Pro, MacBook more is shared. This guide on how to copy a DVD on a Mac tells you how to copy protected/homemade DVD movies on MacBook, iMac 5K, Mac Mini etc (Mojave) to hard drive, DVD, mobiles with fast speed and high quality. MacX DVD Ripper Pro is the best DVD ripper for Mac which can freely backup any DVD disc, ISO image, DVD folder on Mac (MacBook Air/Pro, iMac etc) in 1:1 quality to various video formats (MP4, MOV, MKV, AVI, FLV, etc) and portable devices with original quality.